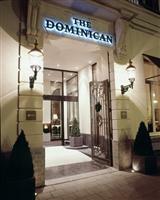 The hotel is located in the city centre, a short walk from the Grand Place, behind the theatre "la Monnaie". A lovely hotel, well located in the heart of the city it's one of the few truely "design" hotels in Brussels. A former monastery and home of French revolutionary painter Jacques- Louis David it fuses the old and the new very well. 08/08. A traditional, historical building, it retains it's 18th century facade. The hotel has two restaurants, "The Grand Lounge" serving lunch and dinner, located on the adjacent to the inner courtyard. The Lounge Bar offers a combination of the traditional cafe and stylish lounge and serves drinks and food throughout the day. The lobby is medium in size but like the rest of the hotel is impressive in it's design and fused the contempory with the tradtional very well. The rooms are large in size and decorated to a high standard, all beautifully, individually designed in a contemporary fashion and offering all modern amenities one would expect. The bathrooms are, like the rooms, of a very high standard. 1 km to the nearest station (central railway), 12 kms to the airport (brussels international), 3 minute walk to the nearest bus stop, 3 minute walk to the nearest metro station (de broucheke), 57 kms to the airport (charleroi), 6 km to the nearest fair site (brussels expo).